Fringilla albicollis Gmelin, 1789, Philadelphia, Pennsylvania. 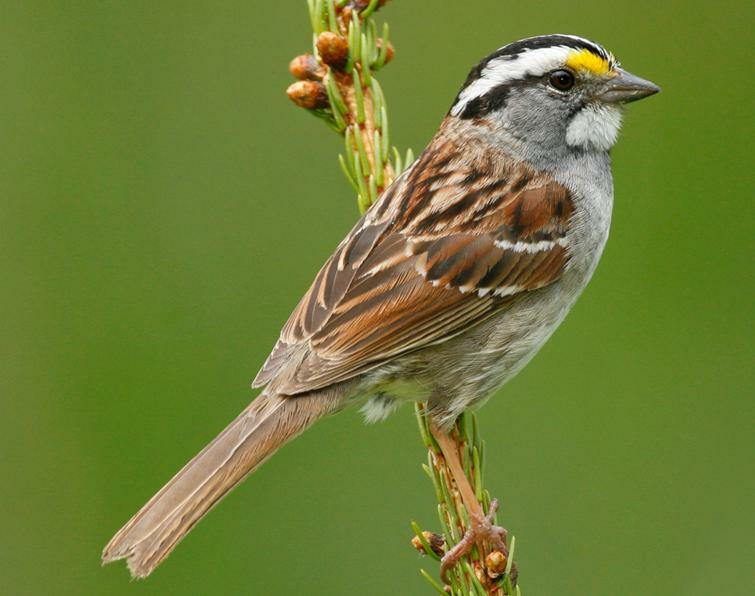 English: White throat, Canada bird; French: Bruant а gorge blanche; German: Weisskehlammer; Spanish: Gorriуn Gorjiblanco. 6–7 in (15–17 cm); 0.9 oz (26 g). 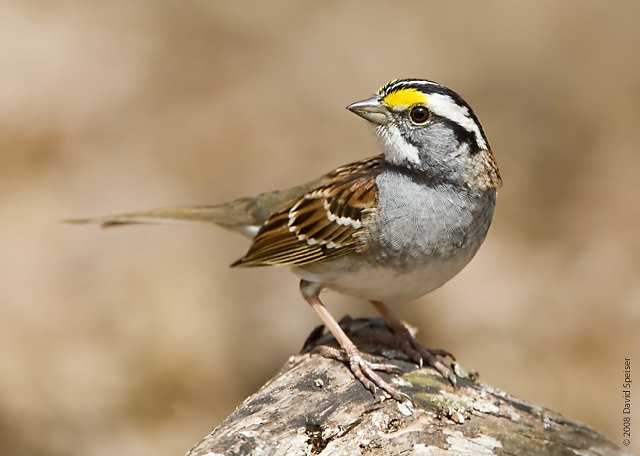 Adults have a pale or white stripe above the eye that is yellow in front of the eye, a pale or white median crown stripe, a white throat, brown or rusty brown back, and a pale grayish brown breast that often is slightly streaked. Sexes similar. 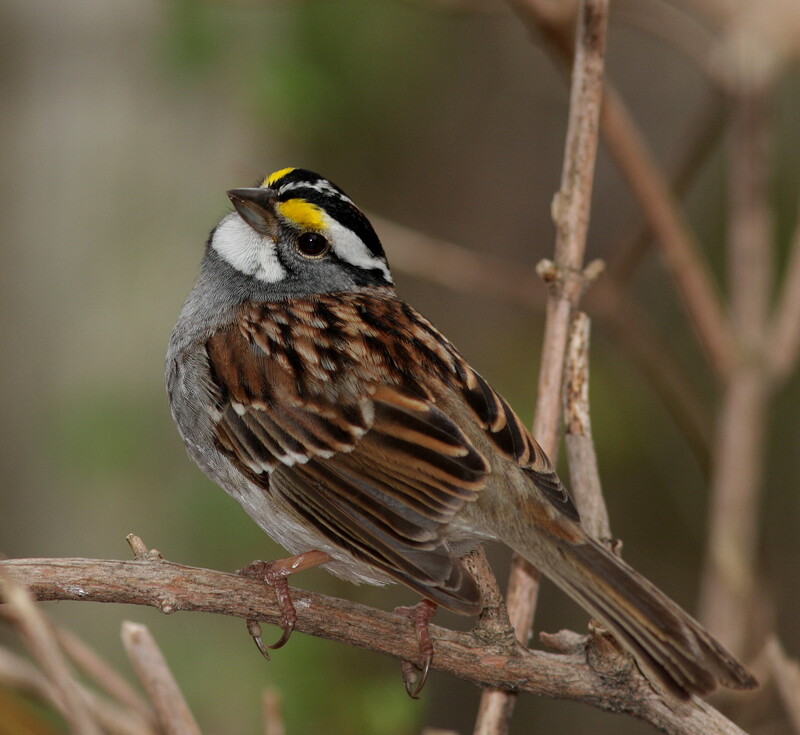 Juveniles have an indistinct median crown stripe and their breast and flanks are heavily streaked with brown. Breed from central Yukon to northern Manitoba and across northern Ontario through central Quebec and Newfoundland; also south to New York, Michigan, Manitoba, and British Columbia. Winter along the Pacific Coast and in the east from Ontario, Michigan, and Colorado to Texas, the Gulf Coast, and Florida. Inhabit brush during all seasons. They most often breed in fairly open mixed woodlands, commonly where spruce, balsam fir, birch, and aspens predominate. In winter they are found in dense deciduous thickets or brush piles, often along the edge of woodlands or in woodland clearings. 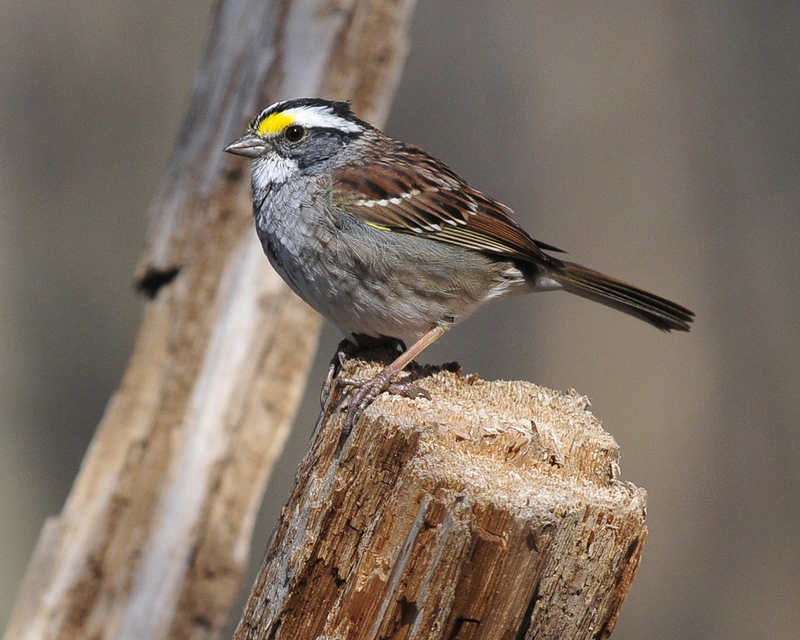 During breeding season, males sing persistently, usually from an inconspicuous perch. 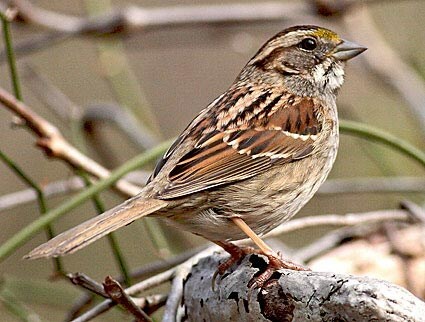 In winter, they are often found in small, loose flocks and sometimes associate with other species of sparrow. In breeding season, they principally eat insects, but during migration and in winter they eat mostly seeds. Monogamous. The nest is placed on or near the ground in areas where there are small trees interspersed with low vegetation. Nesting occurs from late May through early July. Three to seven (usually four) eggs are incubated for 11–13 days, and young fledge after 8–9 days. Both parents feed the young.